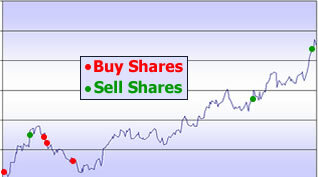 SpireStocks.com's approach to investing is a combination of determining which stocks to own, calculating how much to invest in those stocks, and taking advantage of short-term market fluctuations over the long-term, by buying low and selling high. Our investing approach represents years of experience in analyzing and comparing data and taking advantage of technology. After identifying the most influential factors pertaining to direct stock investing for the long term, a computer model utilizes these evaluation factors to generate a suggested stock list, to include a rank order that is objective, tangible, measurable, and reliable. The ranking of each stock is used to help determine how much to invest. SpireStocks.com sets aside some of the initial cash investment, as a reserve, to take advantage of times when stock prices fall below the original purchase price. Money from selling shares is added to the reserve until enough money has accumulated to trigger the purchase of new stocks, while optimally and automatically adjusting the current holdings to ensure that the portfolio is continuously monitored for optimal extreme performance.